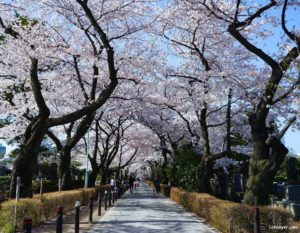 Showa Kinen Park which is just about 60-minutes away from central Tokyo is indeed one of the best hanami spot with its 1,500 cherry trees and spacious lawns. 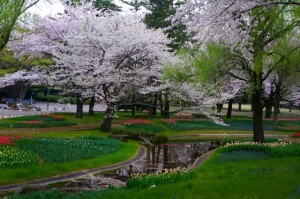 The cherry trees in the park bloom a few days later than central Tokyo too, so it was at its peak during our visit. Aoyama Cemetery (青山霊園) is Japan’s first public cemetery. The straight road leading to the cemetery is lined up by hundreds of cherry trees. Chidorigafuchi-ryokudo (千鳥ヶ淵緑道) is a 700-meter-long walkway along the moat located at the northwest of the Imperial Palace. 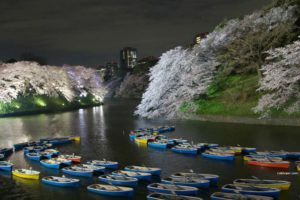 Over 200 cherry trees planted along the banks of the river create an excellent cherry viewing spot.